Anyone who’s spent even a little bit of time around the internet in recent years knows that feminists and social justice warriors will take any opportunity to cry discrimination, but it’s time we had a dispassionate discussion and examined the empirical realities of fairness and equality in gender. If we look at the facts, it’s clear that, despite what some would have you think, it’s not so-called sexism but instead biological gender differences that keep women from succeeding in my meticulously engineered, six-story mega-labyrinth. Every year, I abduct hundreds of people from their homes and drive them on a stolen school bus to a secret location in rural Montana, where lies the treacherous, windowless labyrinth I spent 20 long years designing and building to exacting specifications. 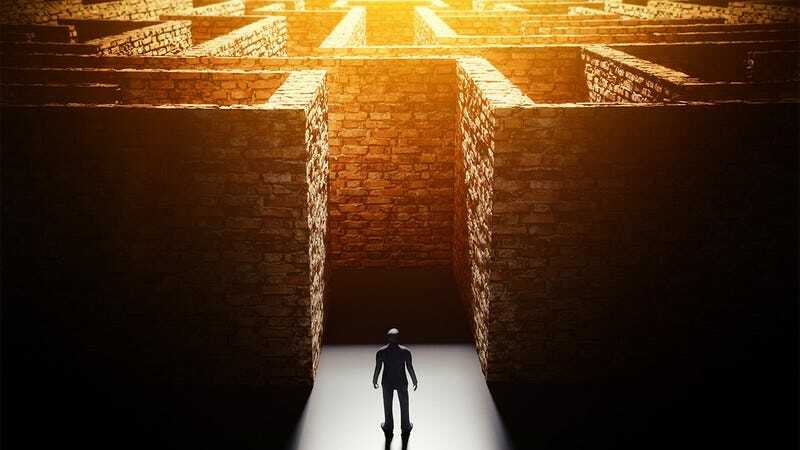 When I let the people loose in my labyrinth, I give each person the same instructions: They are to complete the maze and defeat the furious, starving bull trapped at the center of its topmost level. And every year, about 75 percent of those who complete the task and emerge alive are men. Before you feminazis start crying about how oppressive my labyrinth is, let’s remove emotions from the discussion and think rationally for a second. There are several evolved differences between women’s and men’s brains that explain the gender representation disparity in the Hall Of Exalted Heroes, where I commemorate the people who have survived my hellish complex. It is well-documented that women are genetically predisposed to focus on feelings and think through an empathetic lens, whereas men are hardwired to focus more on ideas and think systematically, innately equipping them to perform better when encountering the endless onslaught of mental and physical rigors posed by my fearsome death labyrinth. This naturally existing disparity in logical ability gives men an advantage when it comes to solving the wall-sized cryptogram that allows them access to the maze’s Final Roundabout, while women often become preoccupied with helping one another through the puzzle and are felled by chutes hidden in the ground around it. Similarly, while men have no problem rushing past the weeping holograms of their childhood selves in the Vault Of Inmost Torment, women frequently cave to their nurturing instincts and try to comfort the realistic 3-D projections, unaware that the mirage exists merely to lure them into the Cobra Crypt. But a gender gap in performance does not imply discrimination—it simply shows that there are certain tasks within my elaborate network of traps and puzzles that men are better-suited to than women. This might send a few women and beta males to their Twitters to drag my name through the mud, but it’s the truth: Women’s and men’s brains are obviously not functionally interchangeable. If they were, why would so many more women than men be unwilling to slay the guards who block the false door at the end of Hallway 367? I doubt liberals have an answer to that question, and I would challenge them to let go of their precious identity politics and admit that men are simply more assertive than women, and they more often complete my set of Herculean tasks for that reason. In many ways, the people who succeed in my labyrinth are a self-selecting group. I try to kidnap about 50 percent men and 50 percent women to take on the challenge, but a great many women choose to escape partway through their maze experience. We live in a free society, and the people who truly want to spend months of their lives slowly making their way through my corridors of nightmares can and will do so. The fact is that, evolutionarily, men are more motivated than women to try to achieve the high level of status that comes from using their bare hands to kill the raging bull in the highest and innermost room of my compound—it’s simple biology, since males in our species use social status to attract mates and reproduce. With that evidence in mind, it’s clear why it’s no fault of mine that there will always be more men finishing my labyrinth than women. “Victimized” women will whine for diversity programs and mentorship opportunities that will help them take on the Vertical Knife Slide in my labyrinth. Or they will claim that I should change the maze to include more interpersonal, emotionally focused challenges in which they can succeed. The logical fallacy in their argument is painfully obvious: To do so would prejudice the maze against the hardworking men who take on my task most cruel, and thus worsen the discrimination that these women claim to hate. For this reason, I refuse to take their pleas into consideration. I will not be swayed by groupthink when it comes to optimizing my enormous labyrinth. Virtue signaling has no place in the mirrored halls of my sprawling maze. Also, let’s not ignore the fact that men face many disadvantages of their own when navigating the labyrinth. Men are far more likely to be seduced into the Black Pond by the gorgeous mouthless geishas and their sultry humming. And the broad male shoulders make it substantially more difficult for men to slink through the Gauntlet Of Pendulous Axes. Plus, even if they do emerge intact, the increased secretions of men’s sweat glands will almost certainly attract the attention of the carnivorous bats that patrol the Antechamber Of Souls—the same bats that typically let women stroll right past. But no, please, tell me more about male privilege. My point is not that women don’t face added challenges in the labyrinth, or that they don’t have valuable skills that can be helpful in my convoluted warren of spike-lined hallways, psychologically torturous rooms, and piranha-stocked moats. Although the liberal thought police would rather me keep my mouth shut, I’m simply trying to say that there are reasons that men dominate in my labyrinth and women don’t, and it’s not because my labyrinth discriminates against women. I would be overjoyed if the exact same amount of women and men crawled sunken-eyed and bloodied out of the tar-slicked tunnel that leads to the roof of my horrible maze each year. But that isn’t what happens—and it’s because of science, not sexism.